Set on a hilltop 10 km from Montalcino overlooking its own vineyards, Castello Banfi - Il Borgo offers elegant rooms. This hotel boasts an outdoor pool, gym and its own winery and cellar. The restaurant serves Tuscan cuisine and local wines. Guests can visit the Cantine Banfi wine cellar and obtain discounts on wine. All guests are offered a free wine tasting of three different Sangiovese wines. Offering views of the Ombrone valley and the vineyards, each room comes with free Wi-Fi, a flat-screen TV with Sky channels, and a walk-in rainfall shower. Some rooms have a bath. Rooms are furnished with wood-beamed ceilings and Tuscan-style interiors. With stone arches and antique chandeliers, the restaurant provides local specialities at lunch and dinner. Breakfast is provided as a buffet. 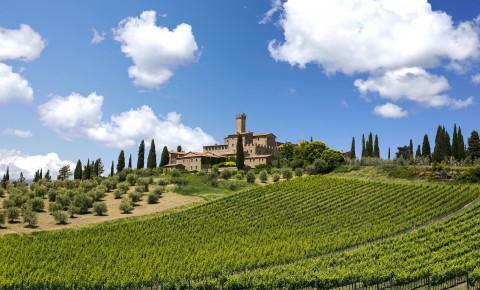 Siena is a 1-hour drive away and Montepulciano is 50 km from the Castello Banfi hotel. Supreme refinement and Tuscan elegance for the Deluxe Riserva. With 40 square meters it offers a fascinating and roomy setting which includes the bedroom with an ample king size bed (200 cm x 200 cm), a Tuscan style armoire with drawers and a spacious bathroom with a rainfall shower, heated towel rack and double vanity. 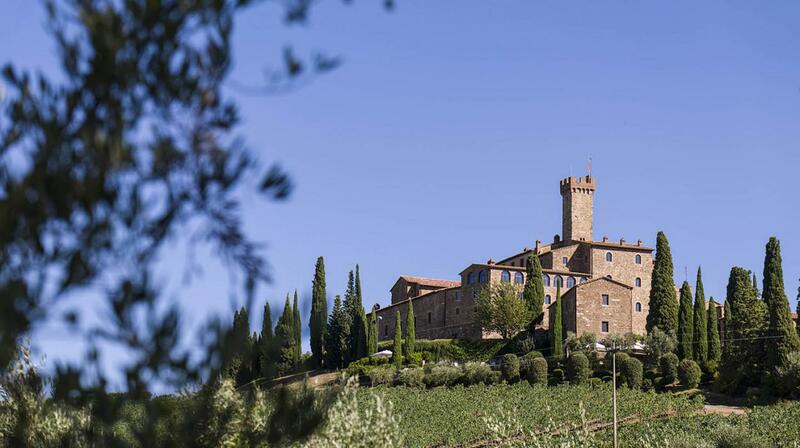 Each room enjoys an extraordinary view of Castello Banfi Il Borgo or the resplendent Tuscan countryside. Every room enjoys an extraordinary view of Castello Banfi’s Borgo or the resplendant Tuscan countryside, and include complimentary Wi-Fi, Nespresso coffee machine and minibar. Elegance, comfort and refinement in Tuscan style characterize the Junior Suite. The size of our suites ranges from 56 sq mt to 65 sq mt/603 sq ft to 699 sq ft, included a large bedroom with king size bed (200 x 200 cm/79" x 79"), a Tuscan style wardrobe and dresser, separate living room with a sofa bed, bathroom with heated towel racks, double vanity and large walk-in rain-fall shower. Each area enjoys an extraordinary view onto Castello Banfi Il Borgo or the magnificent Tuscan landscape. A splendid apartment of 85 sq mt/914 sq ft, includes an extremely large bedroom with king size bed (200 x 200 cm/79” x 79”), Tuscan style wardrobe and dresser, a living room with a sofa bed, two bathrooms with heated towel racks, double sink and large walk-in rain-fall shower. to looking over the relaxing and charming Borgo of Castello Banfi. Extremely elegant and wide, 110 sq mt/1.184 sq ft, this magnificent location includes an extremely large bedroom with king size bed (200 x 200 cm/79” x 79”) and separate sitting area, large Tuscan style wardrobe and dresser, bathroom with walk-in rain-fall shower and separate bathtub, double sink and heated towel racks; a living room with a sofa bed with direct access to a second bathroom with large walk-in rain-fall shower, double sink and heated towel racks. A unique wine Suite with an exclusive list of rare vintages from our Poggio all’Oro Riserva collection. The elegance of the furnishings and their precious fabrics tell the story of elegant Tuscan tradition. The suite includes complimentary Wi-Fi, minibar and Nespresso coffee machine.